This Error Message Article explains the Microsoft SQL Server Management Studio error message “Cannot connect to [Server Name\SQL Instance]. Additional Information: A network-related or instance specific error occurred while establishing a connection to SQL Server. The server was not found or was not accessible. Verify that the instance name is correct and that SQL Server is configured to allow remote connections. (provider: SQL Network Interfaces, error: 28 – Server doesn’t support requested protocol) (Microsoft SQL Server)” and details how to fix the underlying problem that caused it to appear. This message indicates that an instance of SQL Server cannot be opened. One cause is that the instance of SQL that is being contacted does not have the correct Network Protocol enabled. The default values installing SQL Express is to have TCP/IP Network Protocol disabled. 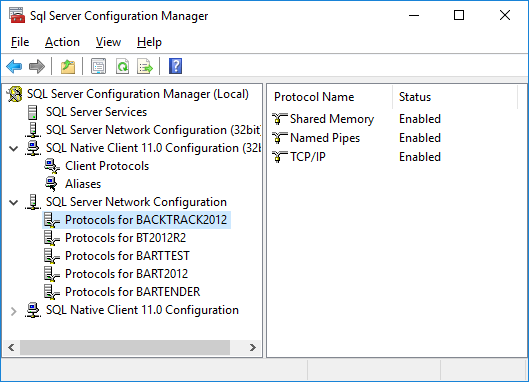 Enable TCP/IP Network Protocol on the SQL Server. Note: unless there are specific reasons, you should enable all 3 protocols; Shared Memory, Named Pipes and TCP/IP. Error Message First Appeared: Windows 7 using SQL Management Studio 2008 connecting to SQL 2012 running Windows Server 2008.